Sporty Express Styling and Great Performance! A ruggedly built, dramatically styled and luxuriously appointed express cruiser equipped for comfortable weekends or extended cruising. 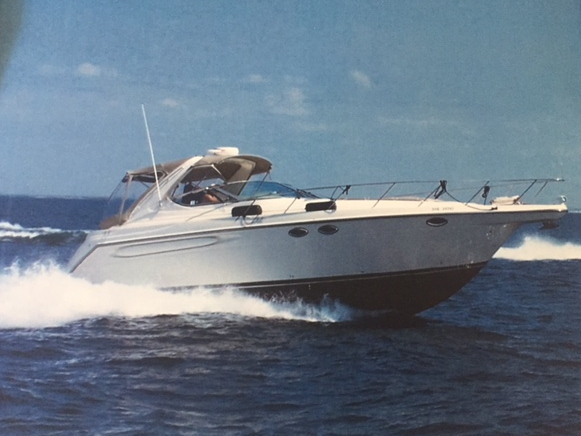 The 2001 Maxum 3700 SCR offers superior performance with all the creature comforts you'd expect in a mid-size express. The two-level cockpit sits 3 at the helm and 3-4 more in comfort on the aft lounge with a convenient wet bar refreshment centre within easy reach. An integral swim platform houses two large storage compartments for equipment and water toys. Below decks the layout is open-concept with lots of natural lighting provided by overhead hatches and side portlights. The salon has a U-shaped dinette opposite a full-service galley with loads of usable cupboard space. There is an island queen berth forward and a mid cabin berth that converts to a queen if required. This rare, freshwater Maxum 3700 is exceptionally clean and shows like a dream. The cockpit sole is finished in synthetic decking offering the rich look of traditional teak without the maintenance, and the upholstery is in like-new condition from stem to stern. A full suite of electronics at the helm including radar, chart plotter and autopilot, will let you cruise with confidence in just about any conditions, and you can be confident the big-block Mercury Horizon engines, with only 725 hours on the meters, will deliver many more years of reliable boating. Overall, exceptional value in a very desirable express cruiser. Don't miss out!